I haven’t posted in awhile. Been in a funk. I have been wanting to write but didn’t have the heart, the energy, or the words of what I wanted to say. This post isn’t about sympathy. It’s about a lesson learned as well as maybe to do two other things – to let others struggling know they aren’t the only ones and to let those who are able to run or walk but don’t due to stress, work, funks, exhaustion… to just do it and not complain about it. It could be so much worse. You might get told one day you can’t. Maybe for a week. A month. Maybe forever. If you have now, don’t waste ever take it for granted. I’m here in hell. I haven’t walk, worked out, or ran in 3 weeks. An injury (I thought from shovelling March 5&6 but could have been from a run I did before shovelling, or from kettlebell workout I did 2 days after shovelling, or one that had been worsening for some time and I didn’t know) has left me in extreme pain and limited mobility. I kept working (I am a teacher and a mixture of guilt, stubbornness and a bit of denial of how terrible I felt) and my first idea was to try massage. Unfortunately, it got worse. So I went to my family doctor who prescribed anti-inflammatory and immediately sent me to physio. Saw physio last Tuesday (March 20). Physio thinks I actually have a hip labral tear and a back injury. She also believes it may have been one that started before shovelling and that just worsened it. I think back to Sunday, March 4. I had gone for a 7k run in the afternoon of the day the large amount of snow started to fall. I could have skipped it. I could have done the treadmill. I could have freaking snowshoed – I have new ones I haven’t even tried yet! But I’m so strict on myself and my routines that I do fixate on that damn schedule I make for myself based off of recommendations. I let myself ignore that the training plan can be modified or skipped if necessary. Snow was up to my ankles or deeper. Today should have been one of this skipped or modified workouts. But it was long run Sunday and my stubborn self fixated on that so… I ran. I thought it was awesome to be that runner who braved the elements and did her run anyway anyhow. But what I forgot in my superwoman moment was that running in snow so deep that made me run in a bad form – sort of like a wide leg hop run? If you’re a runner you probably know what I mean! So – was it worth risking an injury by running in it? Then, I’d probably say yes. Now – I know it was the worst decision. You never regret until it’s too late. Lesson learned and hopefully if you’re like me, you’ll remember this story and my hard lesson learned if you’re ever stuck with a decision of running in bad weather that will affect your form. My Conviction Fitness trainer has said to me before – “the most important workout is tomorrow’s”. I wish I’d listen to his advice that week. I wouldn’t have ran in that deep snow. I wouldn’t have shovelled for 6 hours straight. I wouldn’t have gone to a kettlebell workout exhausted and already sore from shovelling. But back to that day at my first physio appointment. My therapist was shocked that I was working and adamantly encouraged me to take time off as I could be hurting myself even more. She also sent me back to my family doctor to discuss this time off as she can’t actually do the doctor note for work. Upon her suggestion, my doctor also ordered X-rays (though physio was sure that wouldn’t show the injury she expected, she was wanting to eliminate a fracture in hip). Pain meds were prescribed as this appointment showed him a side of me he’s never seen – he said he’s never seen me not smile even when sick or when I dislocated my finger. My doctor also referred me to a surgeon as urgent but the surgeon told my physician they don’t treat urgent referrals any differently. And it could be 3 months before I see him – for just a freaking diagnosis and plan. My doctor wasn’t happy. He has now referred to a special hip surgeon as only he can order an mri for it. He does treat cases based on urgency and is reviewing my case now. I had physio again today. Though she can’t do as much as they normally do, she’s working on helping the muscle spasms by loosening the muscles around injury (not working the injury itself) very carefully with some finger pressure techniques. Taught how to do some at home. She said the muscles are extremely tight from trying to protect the injury which is causing some of my extreme pain. The most positive news I’ve heard in some time was today when she said that it is actually better that I’m now being referred to this 2nd surgeon as only this doctor treats hip injuries like mine. If I’d waited 3 months to see the other one, he would have actually sent me to see the 2nd one himself as well – wasting all that time. She knows him and will email him as well hoping to help make my case even more a priority. I saw this surgeon’s website and he highly respects physiotherapists and says they should be able to do referrals to surgeons too. Something my province is trying to change. Hopefully her email helps. I hate being stuck in limbo. 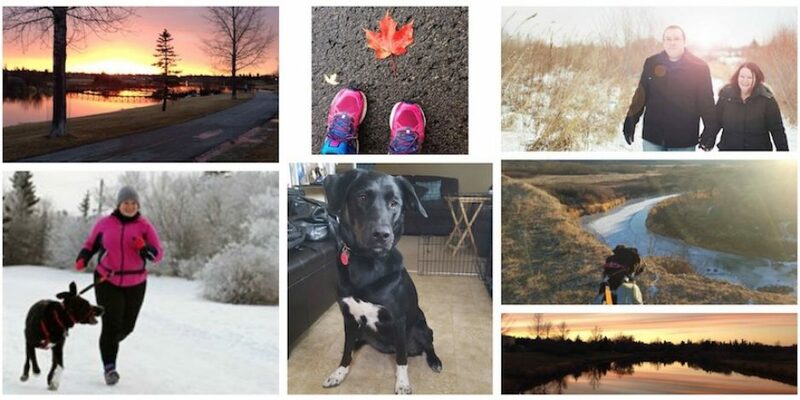 Freaking about the missed steps (typically 15000-25000 for me), the runs, the spartan workouts, the Kettlebell workouts, the adventures, the time with my fur baby running partner and just all the life I’ve been missing. I went from 3 Spartan SGX workouts a week with the best team ever, 3-4 runs a week of about 25-30km weekly, multiple walks and hikes, bike rides (mostly in spring and summer), and 3 Kettlebell workouts a week – to literally nothing. Life isn’t meant to be alone from the world and stuck in bed on multiple pain meds just to function a little while waiting for the phone to ring and counting how many days you’ve already waited. So when you don’t think you can get out there mentally but you can physically – do it. Don’t let the barrier from being physical be your excuses. Do it for me. Do it for others who can’t. Do it for you. And enjoy every single freaking moment of it. You can’t guarantee to get that run or walk or adventure you missed back if something ever happens that leaves you on the sidelines. Life is meant to be lived hard and to be lived to the fullest. Get out there and do just that. As for me, no idea when surgeon will call. I’m doing my best to stay positive but I can’t lie – each day hurts the heart and soul a little bit more. I have amazing family, friends, teammates, and trainer. I’ll let myself cry. But I’ll also keep my smile. I’ll get through this perhaps with some heavy leaning on friends and family. But I will get through it. This too shall pass and I will tie up those shoes again, remember this experience, and make sure that I’m always thinking about the most important workout – tomorrow’s. My running partner is currently now my medicine for the heart and soul. Waiting by me patiently with unconditional love. Together we wait for the first day, regardless of when, to take the first walk (I want to say run but I know it will have to be a walk first) together after this injury.